We're well on our way into the New Year and there's so much in store. I have a lot of goals for Fizzy Party in the coming year and I love that you're joining me on this journey. Before I get to one of my 2014 goals, I want to thank every one of you who stops by and especially those who comment. Your feedback means a lot. One of my goals for 2014 is try new baking adventures. Hopefully all of them with friends. Because spending more time with my friends is another one of my goals. I tried macarons for the first time and will make them again. I had a lot of fun baking with my friend. The next thing I tried was making my own edible glitter. I'm sure you've seen this pin all over Pinterest and I tried to track it back to a web page but couldn't find one. It looks so easy and look at that sparkle! Doesn't exactly sparkle does it? It just looks like coloured sugar. I've been told by several bakers in the know that the only way to achieve this kind of sparkle is with luster dust. If you have this pin and have tried it, what did you think? Did you get the same results as me? Needless to say, this pin got deleted. LOL, I really had to laugh. It's like one of those photos you see on cake wrecks. 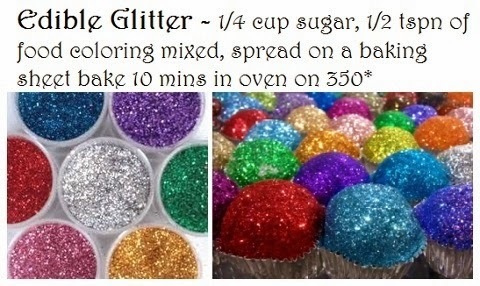 I have never tried it, but there is obviously no way to get that sparkle without lustre dust. A plus for your effort! HUGS! !